Welcome back to another edition of the Team Santa Inc. News Daily. With each edition, we like to talk about and promote the neat holiday products that Team Santa Inc. sells on their website. Today we want to reiterate what has already been said about the Famous String Lights Store. 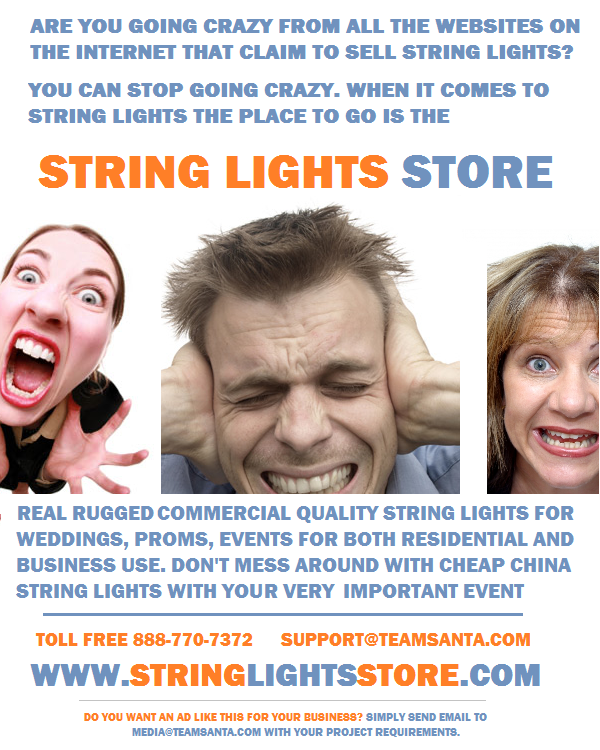 This entire web store sells nothing but string lighting all year round. Every string size, every bulb color, every wire color, both LED and incandescent string lighting. Replacement bulbs. However, most of the new most exciting products are in the LED family. Do you need white wedding lights for your upcoming nuptials? How about tent lighting for evening events held outdoors. Let’s not forget Christmas lighting. How can anyone possibly forget Christmas lights? Nobody has more string lights than the String Lights Store. Their catalog is absolutely enormous and prices so low, you won’t find string lighting at such low prices at any other place. Come visit if you want to scare up a funky display for Halloween this year, String Lights Store has Halloween lights in vibrant colors of purple, orange, green and red. So please stop bye and say hello. If you want something but you are not able to find it, then just send an email to support@teamsanta.com and a representative will find it for you. String Lights Store takes all the major credit/debit cards. You can even pay with PayPal if you want. There is even the opportunity to haggle if you like. If you are looking for high quality string lights, there’s no better place to look than the String Lights Store.